~ E.M. Cioran, Drawn and Quartered, 1983. O’Bannon’s space comedy Dark Star was the largest template for Alien, since disaffected crew-mates, a dingy ship with a used universe aesthetic, an alien intruder, an airduct stalking sequence and third act self-destruct devices all feature in his first cinematic effort. “Alien was very similar,” he said in 1979. “It was just, ‘Well, I can’t make them laugh, maybe I can make them scream.’” Of course, that doesn’t preclude the other films in this article from influencing Alien; they certainly did, but were expressed through Dark Star first. Originality is a modern concern. Literature and film, like man, is no island. They thrive by adaptation and appropriation. Appropriating other stories for frameworks, themes and motifs goes back to the dawn of storytelling: it is why we find an abundance of Flood myths in comparative mythologies; it’s how the Arthurian canon managed to evolve from British comitatus poesies into the French romances of Lancelot and Guinevere and the exploits of the Round Table; it’s why we find Tolkien’s Smaug first appearing in the climax of Beowulf; it is how Shakespeare’s Capulets and Montagues became the Sharks and Jets of West Side Story – in fact, the bulk of the Shakespearean canon are retellings of older works: Romeo & Juliet for one has a multitude of predecessors. What makes ‘new’ pieces of fiction relevant is the ability to recontextualise older works for newer generations, hopefully with the addition of new meanings, applications and resonances; they should master repetition without replication; its effect must be enrichment rather than robbery. It should encourage rivals, not rip-offs. Thanks to the embarrassment of riches that Alien was blessed with –Ridley Scott’s directorial eye, the artistry of Ron Cobb, HR Giger, Chris Foss, Jean Giraud and innumerable others– it succeeded in becoming more than its constituent parts, redefining well-worn tropes and becoming a milestone as a result. It is not a monster-on-a-ship movie (and what is that particular genre if not the Minotaur and the Maze? ), it is the monster-on-a-ship movie. In film, this is not unique, Star Wars being the most famous example – a blend of Flash Gordon and Campbellian monomyth and Kurosawa; a fantasy interspersed with science fiction and the Western. It is worthwhile to analyse Alien’s ‘grandfathers’ to discern what they passed on. In director Edward L. Cahn’s It! 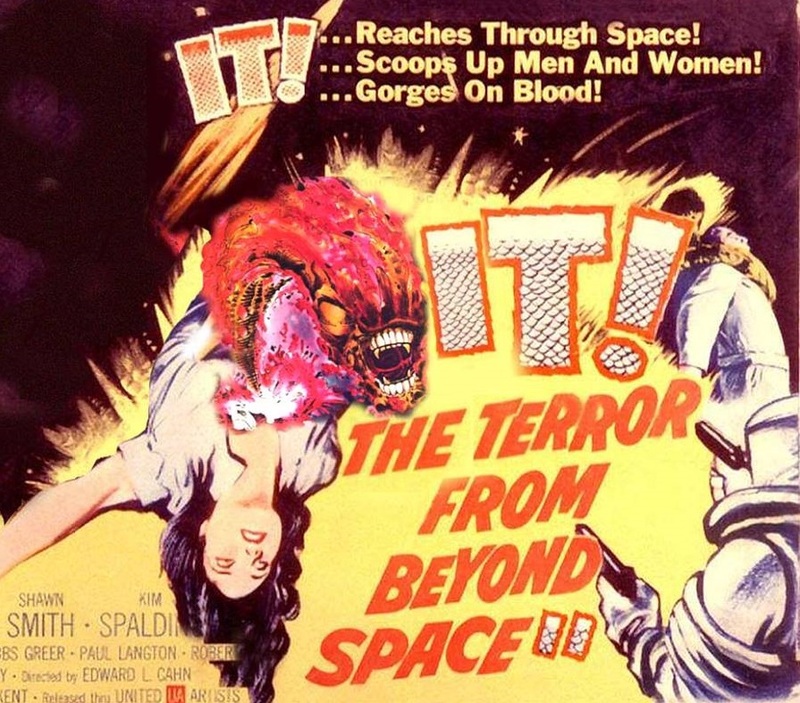 The Terror from Beyond Space a rescue crew is sent to Mars to investigate the fate of a previous expedition. They find one survivor, but suspect him of murdering his comrades. The survivor, Col. Carruthers, insists than an alien entity is responsible. The rescue crew take the Colonel and depart for Earth. Unfortunately, the alien has stowed aboard the ship and starts picking them off. With their weapons ineffective, the survivors retreat to the ship’s control room and, cornered, they don spacesuits and expose the creature to the vacuum of space, quickly suffocating it. The similarities to Alien should not need pointing out. … I think that there were two versions of Alien completed, a scary one and a silly one. The day before the premiere, the theater managers watched them both and decided to show the silly one. It is actually an updated remake of the 1958 film, It! The Terror from Beyond Space, using a squid, a catfish with teeth and inflatable dolls of Heckle and Jeckle, the cartoon magpies. In the future Mr. O’Bannon should refrain from boasting until he sees what kind of film he actually made. 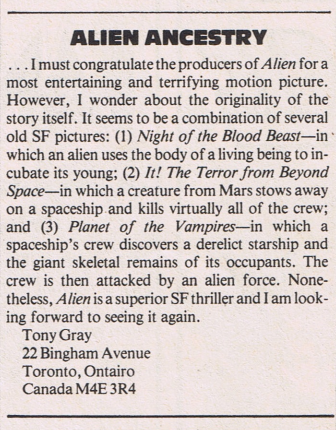 ~ Letters page, Starlog #26, January 1979. In Forbidden Planet a spaceship is sent to a distant world to investigate the fate of a previous expedition. Near the planet’s orbit they receive a signal warning them to stay away, which they ignore. When they arrive they find that only two people (Dr. Morbius and his daughter) have survived the assault of a mysterious alien being. It is revealed that eons ago a technological civilization was mysteriously wiped out. A remnant device called the Great Machine has the power to manifest thoughts into reality – and it is revealed that the mysterious psychic force running amok is a manifestation of Dr. Morbius’ Id. In the end, Dr. Morbius and his psychic offspring are annihilated when Morbius sets the planet to explode, and the investigatory crew escape with his daughter. The influence on Alien may not be entirely clear here, but we should look to Dan’s original screenplay. There, he wrote of a spaceship crew who decide to investigate an apparent SOS (later revealed to be a warning) on a mysterious planet. In the screenplay, the planet contained the ruins of a long destructed alien (or Alien) race. The crew find evidence of another alien species (later nicknamed the Space Jockey in future drafts) on the planet: they were prior explorers who had been decimated by an unknown force, which later turns out to be the long dormant spore of the indigenous Alien. This set-up was entirely excised from the film, but the influence of Forbidden Planet should be clearer. O’Bannon, when first writing the screenplay in 1972, even considered depicting his Alien as “a non-physical, kind of spiritual alien that would possess people,” not too unlike Dr. Morbius’ murderous projection. 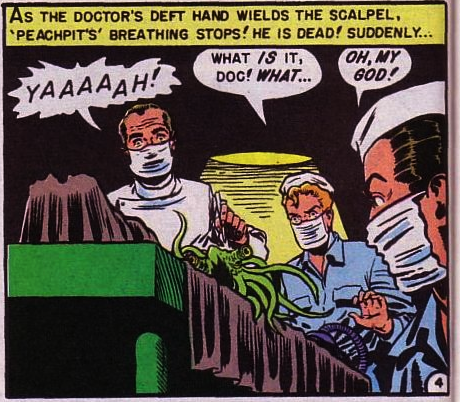 There is also another similarity in that both Dr. Morbius and Ash share an immeasurable thirst for knowledge that is ultimately destructive. Ash’s obsession with the Alien, clearly, goes beyond protocol and detached fascination. ~ Curtis Harrington, terrortrap.com, 2005. A.E. van Vogt’s The Voyage of the Space Beagle has also been touted as an influence, but this has been categorically denied by O’Bannon. Still, van Vogt litigated Twentieth Century Fox over the similarities, and Fox settled out of court. Given Dan’s willingness to attribute ideas to their original sources (he has likewise singled out the individual contributions of Shusett, Cobb, and Ridley on many occasions) it seems odd that he would celebrate every other influence, but then not give van Vogt due credit. ~ Dan O’Bannon, Something Perfectly Disgusting. 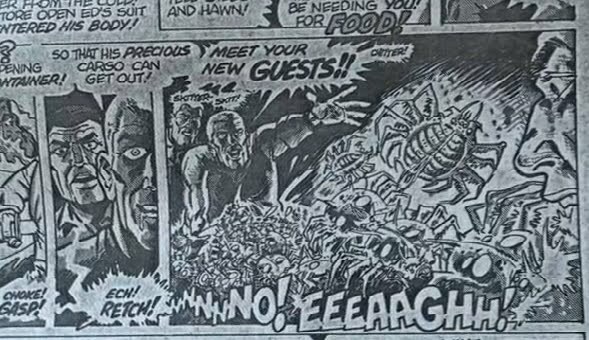 Another comic tale featuring a creature erupting from a man’s body was Weird Science’s ‘Seeds of Jupiter’, featured in the July/August edition in 1951. Alien is not only a successful amalgam of various science fiction influences but also contains obvious consonances with the horror genre. The story of the Nostromo could easily be that of the Demeter, the ship that Dracula stowed upon on his way to London. And if its behaviour or function was similar to monsters in many other films, the Alien itself was not — a triumph of design and presentation, it put a cap on the age of amorphous blobs and pod people and inflated reptilemen and any other rubber exaggeration. Such creatures would continue to appear in B-movie schlock (as would a number of biomechanic imitations), but they could never aspire to be anything more than knock-offs or throwbacks. Despite the simple and familiar trappings (monster seeks and spills blood) Giger’s creature would be the measuring stick by which all future alien monsters would be judged. What else gave the film an edge over its forebearers and competitors? Interestingly, the characters are not the ideologically aligned adventurers and scientists of prior genre movies. They resemble far more closely the disaffected and ennui-ridden cast of O’Bannon’s own Dark Star, but with a corporate twist supplied by David Giler and Walter Hill. There are three distinct tiers in the hierarchy aboard the Nostromo: on the bottom rung are the engineers, Parker and Brett, who are physically separated from the rest of the crew by being consigned below deck. They are also, to their chagrin, paid less than the other crewmembers. Then there is the officer class, consisting of Ripley, Kane and Dallas. Above them is the unseen Company, whose protocol not only allows for divisions between its crew but also allow the conditions on which a hostile organism like the Alien can be allowed on board. Ash exists as an outlier, an anomaly — he represents the Company and is either distrusted or wearily tolerated by both officer and engineer alike. Most if not all of the film’s fans will agree that Ash was another element, tried and almost tired, that was pulled off with the same finesse as the Alien itself. Ridley himself disagreed with Dan, saying years later: “This is a great turnabout in the story because just when you think your main and only aggressor is this thing loose on the ship, you’ve now got a much bigger problem – you’ve got two aggressors, which raises the paranoia and that of the audience twofold.” Critical and fan reception would prove that Ash’s inclusion was ultimately beneficial to the film – not an original one per se, but employed in an innovative and shocking manner. Yet another great write-up! Now I want to watch all of the movies that “inspired” “Alien” for a more complete experience! “Strange Shapes” is amazing! I love all of the articles! Keep em’ coming and THANK YOU for writing them!